Teachers from the Albemarle-Pamlico region learned about estuaries and living shorelines during a presentation on July 20 at the ExPLORE NC professional development workshop at Trinity Center. Rachel Bisesi, coastal education coordinator for the federation’s Ocean office, and high school volunteer Taylor Rutter, presented several lesson plans to the fourth- and fifth-grade teachers in attendance. Each lesson plan incorporated North Carolina curriculum standards so the teachers could use them in their own classrooms. The teachers do the shifting shorelines activity that compares different types of erosion control methods. Photo by Sarah Yelton. Bisesi began the presentation with an estuary lesson. The teachers observed what happens when a jar of “river water” — regular tap water with blue dye added — was placed on top of a jar of “ocean water,” or water with salt and red dye added. Due to differences in salinity, the water turns purple at the point where the jars meet, but they do not combine completely. This purple area represents the brackish water of an estuary, where rivers meet the sea. Estuaries are productive waters that serve as “nurseries” for juvenile fish and other marine life. This led into a lesson about the important role of estuarine ecosystems and was especially applicable to the fifth-grade teachers, whose students are required to learn about ecosystems. The next lesson, which focused on living shorelines, was both in the classroom and on the ground. Teachers participated in the “shifting shorelines” activity which compares different forms of erosion control and determines which one is most effective at protecting the shore and providing habitat. 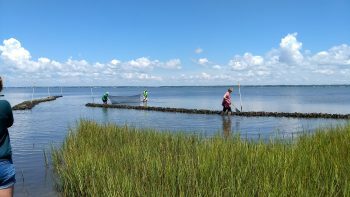 During the living shoreline exploration, the group used seine nets to collect marine life that lives around the shoreline. Photo by Sarah Yelton. During the outdoor component, the teachers walked over to a living shoreline at the center. This living shoreline is comprised of marsh grass and recycled oyster shells. Bisesi then led a “living shoreline shuffle” game which allows students to learn about how marsh grass effectively controls erosion. They also pulled a seine net through the water to check out the marine life that calls the shoreline home. “I always enjoy the opportunity to work with teachers. It is helpful to hear their feedback about the activities we present, and to learn what they think will excite students the most,” Bisesi said. ExPLORE NC is a year-long professional development program run by the Institute for the Environment at the University of North Carolina at Chapel Hill. Sarah Yelton, environmental education coordinator for the institute’s Environmental Resource Program, said the program is designed to teach educators more about watershed-related science, connect them with environmental education resources and help them gain confidence in doing outdoor education programs. The ExPLORE NC program is funded by the Albemarle-Pamlico National Estuary Partnership and the Eddie and Jo Allison Smith Family Foundation. Learn more at http://ie.unc.edu/ExPLORENC/.